I went on an organized tour of Italy a few years back and some of the other tourists’ behavior appalled me. I don’t mean the typical misbehavior we usually hear about. Instead, I’m thinking of a focus on drinking and shopping. People spent significant money to visit a place many people only dream of seeing and they used most of their time on superficial things. Ah, the wonders of Italian engineering. Although I was attempting to capture a significant part of Italian culture with this picture, it also illustrates the world of tourism in my eyes. The cheap materialistic car dominates the foreground while the amazing architecture falls to the background, far from where the eyes focus. Plus, the authentic cultural practice remains off to the side, almost unnoticeable as it exits the frame. 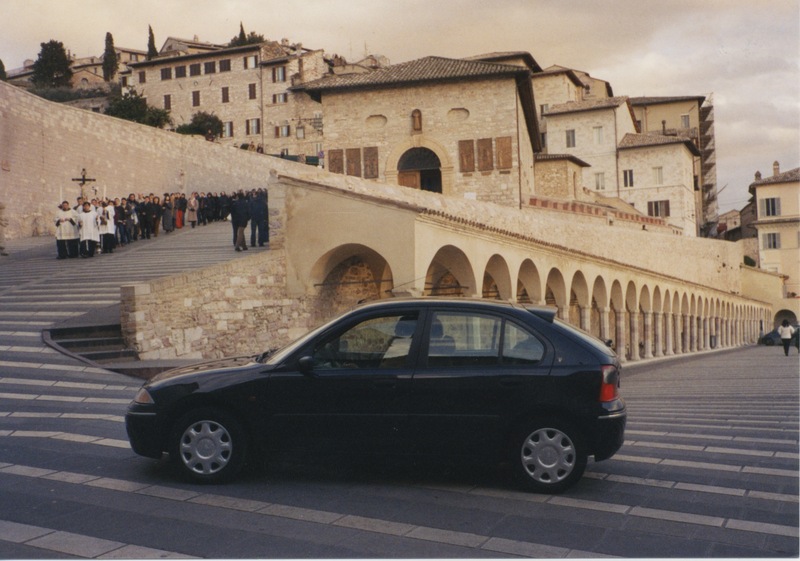 The first time I was in Assisi was on a tour from Rome. The bus let us off at a hotel to eat. Most of the tourists spent the afternoon eating fried chicken. I guess they don’t have chicken in their home towns. I toured the churches because we don’t have any saint in my home town. Fried chicken? Yikes. There are a few good fried chicken preparations in Italian cuisine, but I suspect that’s not what you meant. When I went on my tour, people were complaining about having to eat so much pasta. Nevertheless, I do make one strange recommendation to Americans who are visiting Europe: visit McDonald’s. It’s a real learning experience to see how McDonald’s adapts to different cultures. The home of one of my favorite saints. Love this picture.